An exclusive economic zone (EEZ) is a sea zone prescribed by the United Nations Convention on the Law of the Sea over which a state has special rights regarding the exploration and use of marine resources, including energy production from water and wind. It stretches from the baseline out to 200 nautical miles (nmi) from its coast. In colloquial usage, the term may include the continental shelf. The term does not include either the territorial sea or the continental shelf beyond the 200 nmi limit. The difference between the territorial sea and the exclusive economic zone is that the first confers full sovereignty over the waters, whereas the second is merely a “sovereign right” which refers to the coastal state’s rights below the surface of the sea. The surface waters, as can be seen in the map, are international waters. Generally, a state’s exclusive economic zone is an area beyond and adjacent to the territorial sea, extending seaward to a distance of no more than 200 nmi (370 km) out from its coastal baseline. The exception to this rule occurs when exclusive economic zones would overlap; that is, state coastal baselines are less than 400 nmi (740 km) apart. When an overlap occurs, it is up to the states to delineate the actual maritime boundary. Generally, any point within an overlapping area defaults to the nearest state. A state’s exclusive economic zone starts at the seaward edge of its territorial sea and extends outward to a distance of 200 nmi (370 km) from the baseline. 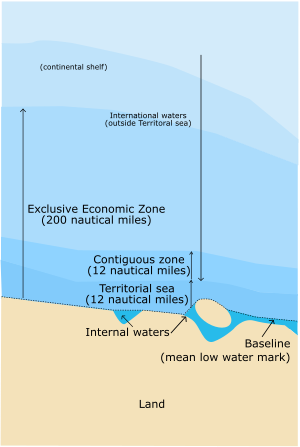 The exclusive economic zone stretches much further into sea than the territorial waters, which end at 12 nmi (22 km) from the coastal baseline (if following the rules set out in the UN Convention on the Law of the Sea). 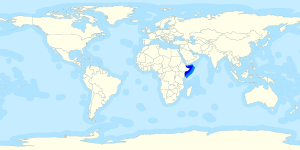 Thus, the exclusive economic zones includes the contiguous zone. States also have rights to the seabed of what is called the continental shelf up to 350 nmi (650 km) from the coastal baseline, beyond the exclusive economic zones, but such areas are not part of their exclusive economic zones. The legal definition of the continental shelf does not directly correspond to the geological meaning of the term, as it also includes the continental rise and slope, and the entire seabed within the exclusive economic zone. Initially, a country’s sovereign territorial waters extended 3 nmi or 5.6 km (range of cannon shot) beyond the shore. In modern times, a country’s sovereign territorial waters extend to 12 nmi (22 km) beyond the shore. One of the first assertions of exclusive jurisdiction beyond the traditional territorial seas was made by the United States in the Truman Proclamation of September 28, 1945. However, it was Chile and Peru respectively that first claimed maritime zones of 200 nautical miles with the Presidential Declaration Concerning Continental Shelf of 23 June 1947 (El Mercurio, Santiago de Chile, 29 June 1947) and Presidential Decree No. 781 of 1 August 1947 (El Peruano: Diario Oficial. Vol. 107, No. 1983, 11 August 1947). Norway and Russia dispute both territorial sea and EEZ with regard to the Svalbard archipelago as it affects Russia’s EEZ due to its unique treaty status. A treaty was agreed in principle in April 2010 between the two states and subsequently ratified, resolving this demarcation dispute. The agreement was signed in Murmansk on September 15, 2010. Croatia‘s ZERP (Ecological and Fisheries Protection Zone) in the Adriatic Sea caused friction with Italy and Slovenia, and caused problems during Croatia’s accession to the European Union. France claims a portion of Canada’s EEZ for Saint-Pierre-et-Miquelon based on a new definition of the continental shelf and EEZ between the two countries. Saint-Pierre-et-Miquelon is entirely surrounded by Canada’s EEZ. Turkey claims a portion of Cyprus‘s EEZ based on Turkey’s peculiar[according to whom?] definition that Cyprus is only entitled to a 12 nautical mile EEZ rather than the usual 200 that Turkey and all other countries are entitled to, including an area to the south of Cyprus containing an offshore gas field. Furthermore, the internationally unrecognized Turkish Republic of Northern Cyprus (TRNC), which was created as result of the Turkish Invasion of Cyprus, also claims portions of Cyprus’s EEZ. Cyprus and the international community do not acknowledge the Turkish claims on Cyprus’s land and sea, which are viewed as illegal under international law. Fisheries management, usually adhering to guidelines set by the FAO, provides significant practical mechanisms for the control of EEZs. Transboundary fish stocks are an important concept in this control. Transboundary stocks are fish stocks that range in the EEZs of at least two countries. Straddling stocks, on the other hand, range both within an EEZ as well as in the high seas, outside any EEZ. A stock can be both transboundary and straddling. Australia‘s Exclusive Economic Zone was declared on 1 August 1994, and extends from 12 nautical miles to 200 nautical miles (370 km) from the coastline of Australia and its external territories, except where a maritime delimitation agreement exists with another state. To the 12 nautical miles boundary is Australia’s territorial waters. Australia has the third largest exclusive economic zone, behind France and the United States, but ahead of Russia, with the total area of 8,148,250 square kilometres, which actually exceeds its land territory. The United Nations Commission on the Limits of the Continental Shelf confirmed, in April 2008, Australia’s rights over an additional 2.5 million square kilometres of seabed beyond the limits of Australia’s EEZ. Australia also claimed, in its submission to the UN Commission on the Limits of the Continental Shelf, additional Continental Shelf past its EEZ from the Australian Antarctic Territory, but these claims were deferred on Australia’s request. However, Australia’s EEZ from its Antarctic Territory is approximately 2 million square kilometres. 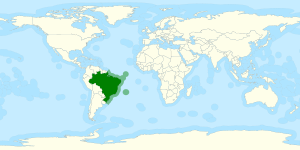 Brazil’s EEZ includes areas around the Fernando de Noronha Islands, St Paul and St. Peter Archipelago and the Trindade and Martim Islands. Chile’s EEZ includes areas around the Desventuradas Islands, Easter Island and the Juan Fernández Islands. The first figure excludes all disputed waters, while the last figure indicates China’s claimed boundaries, and does not take into account neighboring powers’ claims. According to published maps, the Israel government has recognized the Exclusive Economic Zones (EEZ) of Greece and Cyprus. They describe the course of the gas pipeline which will transfer gas produced by American Νoble Εnergy Ltd. from the Leviathan reservoir to Europe, through an undersea pipeline crossing Greece. The gas pipeline should traverse the sea area, which according to international law, is part of the Greek EEZ. By this proposal, Israel recognizes the Greek EEZ in the area and offers an advantage that Greece can use during negotiation procedures to support its claims on the area. In practice, this cooperation will set up a powerful energy coalition between Greece, Cyprus and Israel. The mining and operating part will be undertaken by an American company. “The substance of the issue is that in an effort to protect and secure vital Israeli interests in the Mediterranean Sea, Israel has been left with no choice other than to officially delimit its maritime borders”. In 2010, an agreement was signed with Cyprus concerning the limit of territorial waters between Israel and Cyprus at the maritime halfway point, a clarification essential for safeguarding Israel’s rights to oil and underwater gas reservoirs. The agreement was signed in Nicosia by Israeli Infrastructure Minister Uzi Landau and the Cypriot Foreign Minister Markos Kyprianou. The two countries agreed to cooperate in the development of any cross border resources discovered, and to negotiate an agreement on dividing joint resources. Japan has disputes over its EEZ boundaries with all its Asian neighbors (Russia, Republic of Korea, China and Taiwan). The above, and relevant maps at the Sea Around Us Project both indicate Japan’s claimed boundaries, and do not take into account neighboring powers’ claims. Japan also refers to various categories of “shipping area” – Smooth Water Area, Coasting Area, Major or Greater Coasting Area, Ocean Going Area – but it is unclear whether these are intended to have any territorial or economic implications. Mexico‘s exclusive economic zones comprise a total surface area of 3,144,295 km2, and places Mexico among the countries with the largest areas in the world. This puts Mexico’s total territory as 5,153,735 km2. New Zealand‘s EEZ covers 4,083,744 km2 (1,576,742 sq mi), which is approximately fifteen times the land area of the country. Sources vary significantly on the size of New Zealand’s EEZ; for example, a recent government publication gave the area as roughly 4,300,000 km2. These figures are for the EEZ of New Zealand proper, and do not include the EEZs of other territories in the Realm of New Zealand (Tokelau, Niue, the Cook Islands and the Ross Dependency). 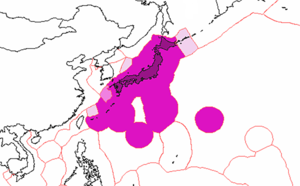 In the Sea of Japan, the North Korean EEZ can be approximated to be trapezoidal-shaped. The border between North Korea and Russia’s respective EEZs is the only such border that has been determined in East Asia. Here, the EEZ does not cause many problems, even with regards to South Korea, because the sea is not thought to be rich in resources. 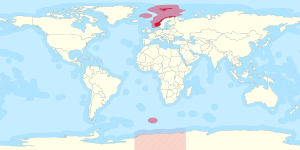 In April 2009, the United Nations Commission for the Limits of the Continental Shelf approved Norway’s claim to an additional 235,000 square kilometres of continental shelf. The commission found that Norway and Russia both had valid claims over a portion of shelf in the Barents Sea. The Philippines‘ EEZ covers 2,263,816 km2 (874,064 sq mi). Spain disputes the EEZ’s southern border, maintaining that it should be drawn halfway between Madeira and the Canary Islands. But Portugal exercises sovereignty over the Savage Islands, a small archipelago north of the Canaries, claiming an EEZ border further south. Spain objects, arguing that the Savage Islands do not have a separate continental shelf, citing article 121 of the United Nations Convention on the Law of the Sea. 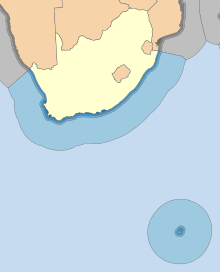 South Africa‘s EEZ includes both that next to the African mainland and that around the Prince Edward Islands, totalling 1,535,538 km2. 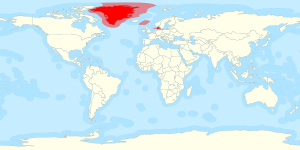 The United Kingdom’s exclusive economic zone is the fifth largest in the world at 6,805,586 square km. It comprises the exclusive economic zones surrounding the United Kingdom, the Crown Dependencies, and the British Overseas Territories. The figure does not include the EEZ of the British Antarctic Territory. 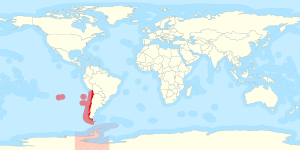 The exclusive economic zones associated with the Falkland Islands and South Georgia are disputed by Argentina. 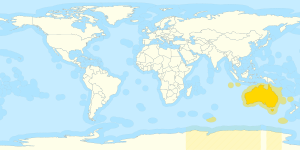 The EEZ of the Chagos archipelago also known as the British Indian Ocean Territory is also disputed with Mauritius which considers the EEZ as part of its territory. 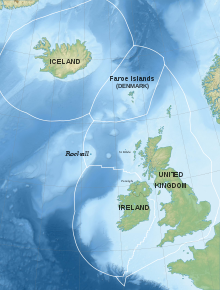 The UK was late to establish an EEZ, relying on overlapping maritime zones for fisheries, pollution control, and energy matters. The Marine and Coastal Access Act 2009 gave the powers to establish an EEZ, with the zone defined by which came into force on 31 March 2014. 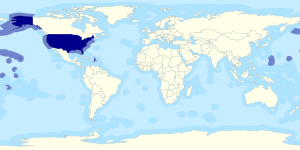 The United States’ exclusive economic zone is the largest in the world, covering 11,351,000 km2. 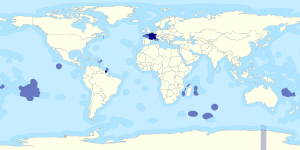 Areas of its EEZ are located in three oceans, the Gulf of Mexico, and the Caribbean Sea. ^ “Part V – Exclusive Economic Zone, Article 56”. Law of the Sea. United Nations. Retrieved 2011-08-28. ^ “Part V – Exclusive Economic Zone, Articles 55, 56”. Law of the Sea. United Nations. ^ “Im östlichen Mittelmeer sollen Erdgasvorkommen von mehreren Billionen Kubikmetern liegen. Das befeuert den Zypernkonflikt”. Neue Zürcher Zeitung. 12 November 2018. Retrieved 13 November 2018. ^ “NZZ: Boreholes rekindle the Cyprus problem (original: ΝΖΖ: Οι γεωτρήσεις αναζωπυρώνουν το Κυπριακό)”. Kathimerini. 13 November 2018. Retrieved 13 November 2018. ^ “Gas Partnership: Netanyahu Visits Cyprus”. Retrieved 1 April 2017. ^ Makris, A. “Cyprus Calls on Turkey to Steer Away From Threats – GreekReporter.com”. Retrieved 1 April 2017. ^ European Consortium for Church-State Research. Conference (2007). Churches and Other Religious Organisations as Legal Persons: Proceedings of the 17th Meeting of the European Consortium for Church and State Research, Höör (Sweden), 17–20 November 2005. Peeters Publishers. p. 50. ISBN 978-90-429-1858-0. There is little data concerning recognition of the ‘legal status’ of religions in the occupied territories, since any acts of the ‘Turkish Republic of Northern Cyprus’ are not recognized by either the Republic of Cyprus or the international community. ^ Nathalie Tocci (January 2004). EU Accession Dynamics and Conflict Resolution: Catalysing Peace Or Consolidating Partition in Cyprus?. Ashgate Publishing, Ltd. p. 56. ISBN 978-0-7546-4310-4. The occupied territory included 70 percent of the island’s economic potential with over 50 percent of the industrial … In addition, since partition Turkey encouraged mainland immigration to northern Cyprus. … The international community, excluding Turkey, condemned the unilateral declaration of independence (UDI) as a. ^ Peter Neville (22 March 2013). Historical Dictionary of British Foreign Policy. Scarecrow Press. p. 293. ISBN 978-0-8108-7371-1. …Ecevit ordered the army to occupy the Turkish area on 20 July 1974. It became the Turkish Republic of Northern Cyprus, but Britain, like the rest of the international community, except Turkey, refused to extend diplomatic recognition to the enclave. British efforts to secure Turkey’s removal from its surrogate territory after 1974 failed. ^ “AWARD OF THE ARBITRAL TRIBUNAL IN THE SECOND STAGE OF THE PROCEEDINGS (MARITIME DELIMITATION)”. Permanent Court of Arbitration. Archived from the original on 12 April 2015. Retrieved 12 April 2015. ^ Kwiatkowska, Barbara (January 2001). “The Eritrea-Yemen Arbitration: Landmark Progress in the Acquisition of Territorial Sovereignty and Equitable Maritime Boundary Delimitation”. Ocean Development and International Law. 32 (1). doi:10.1080/00908320150502177. ^ Wildlife Habitat Canada. Canada’s Marine Waters: Integrating the Boundaries of Politics and Nature Archived 2005-12-21 at the Wayback Machine. ^ Γραφείο Τύπου και Πληροφοριών – About us. Cyprus.gov.cy. Retrieved on 2013-07-23. ^ Sunderarajan, P. “India hopes to double its EEZ”. Retrieved 1 April 2017. ^ including areas recommended by “CLCS”. ^ Inc., Advanced Solutions International,. “404” (PDF). Archived from the original (PDF) on 23 March 2004. Retrieved 1 April 2017. ^ “PREAMBLE TO THE UNITED NATIONS CONVENTION ON THE LAW OF THE SEA”. Retrieved 1 April 2017. ^ “Sea Around Us Project – Data and Visualization”. Archived from the original on 27 April 2006. Retrieved 1 April 2017. ^ a b c “Sea Around Us – Fisheries, Ecosystems and Biodiversity”. Retrieved 1 April 2017. ^ 10 Downing Street. “Countries within a country”. Archived from the original on 2010-04-16. Retrieved 2010-01-16. ^ “The Exclusive Economic Zone Order 2013” http://www.legislation.gov.uk. Retrieved 20 July 2014. ^ Gibson, J. (January 2009). 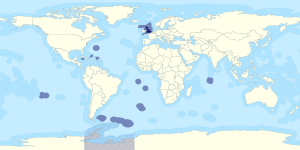 “The United Kingdom’s elusive exclusive economic zone”. Journal of Water Law. 20 (4). Retrieved 20 November 2018. ^ “The Exclusive Economic Zone Order 2013”. legislation.gov.uk. 11 December 2013. Retrieved 20 November 2018. Kotch, John Barry; Abbey, Michael (2003). “Ending naval clashes on the Northern Limit Line and the quest for a West Sea peace regime” (PDF). Asian Perspectives. 27 (2): 175–204. Archived from the original (PDF) on 25 July 2011. Prescott, John Robert Victor; Schofield, Clive H. (2001). Furness, Shelagh (ed.). “Undelimited Maritime Boundaries of the Asian Rim in the Pacific Ocean”. Maritime Briefing. Durham: International Boundaries Research Unit, University of Durham. 3 (1). ISBN 978-1-897643-43-3. Van Dyke, Jon M. (2009). “Disputes Over Islands and Maritime Boundaries in East Asia”. In Seoung Yong Hong, Jon M.; Van Dyke (eds.). Maritime Boundary Disputes, Settlement Processes, and the Law of the Sea. Leiden: BRILL. pp. 39–76. ISBN 90-04-17343-9.